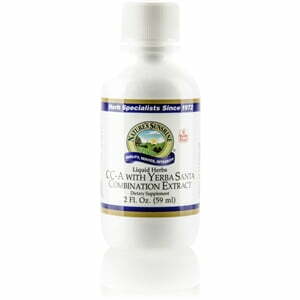 Nature’s Sunshine CC-A with Yerba Santa supports the immune, respiratory, and circulatory system. 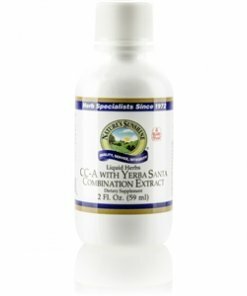 A longtime Nature’s Sunshine favorite, CC-A with Yerba Santa includes golden seal, astragalus, sage, and rose hips, all known for their immune-boosting powers. Mullein and yarrow, two additional herbal ingredients in CC-A Yerba Santa, nourish the immune system while capsicum supports the circulatory system. Instructions: Adults: Take approximately 20 to 25 drops (1 ml) in 2 ounces of warm water with a meal twice daily. Children: Take approximately 10 to 15 drops (0.5 ml) in 2 ounces of warm water with a meal twice daily. A natural and pure extract composed of the finest rose hips fruit (Rosa canina), chamomile flowers (Matricaria recutita), mullein leaves (Verbascum thapsus), yarrow flowers (Achillea millefolium), yerba santa leaves (Eriodictyon californicum), golden seal rhizome (Hydrastis canadensis), myrrh gum (Commiphora molmol), peppermint leaves (Mentha piperita), sage leaves (Salvia officinalis), astragalus root (Astragalus membranaceus), slippery elm bark (Ulmus fulva), lemon grass aerial parts (Cymbopogon citratus), and capsicum fruit (Capsicum annuum) (with water and alcohol).